Who put the "C" in ICT... and why on earth? 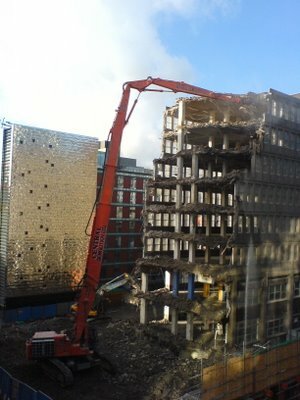 Got in to work this morning to find the Big Machine across the road tearing into the top floor with much noise and dust. So I took some pictures, of which this is the most dramatic. I should probably upload the others to flickr, but I'm generally too lazy. I'd just spent time time at work using a spreadsheet, and I'd forgotten what a fantastic thing the spreadsheet is. You can put stuff wherever you want, and generally run riot, the inventors of Visi Calc gave us the ultimately usable playground for arithmetic. If you're into IT archeology you can download visicalc from here. What has happened since? Well the "C" was added to IT to make it ICT, and the internet was invented, bringing us the delights of clumsyness, crappinness and crooks. From a people perspective communication is a fine thing. As a programmer I like the internet because it joins computers up and I can have fun with that. But from the "useful-computer for people to do stuff with" point of view HTML and the www has made us take one step forward and a big lurching stagger back. I know a lot of people are working hard to make up the lost gound, but really, should it be so hard? Right you can flame me now.